Approximately the height of an average human, Rutgar-4 is a Shard crystal who inhabits a modified, dark gray HK-47 body. He wears a darkened medium armor over his droid body for additional protection, as well as a partial face mask with a voice modulator. 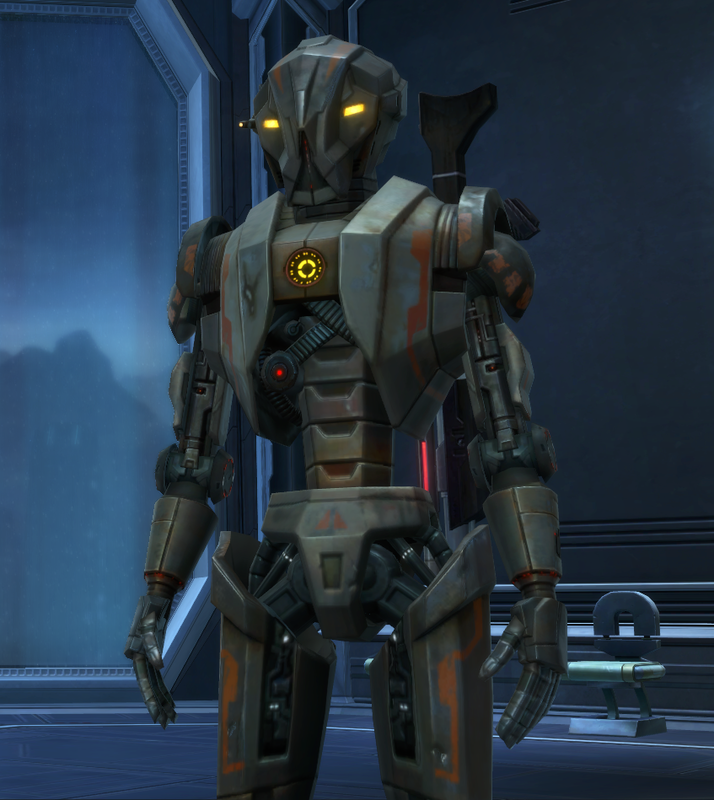 Rutgar-4, himself a red crystal — unlike many other Shards — is located in the droid's chest cavity, protected by layers of metal. Through a combination of preparing, studying, and analyzing, Rutgar-4 creates detailed battle plans and tries to think two steps ahead of the enemy. At times, however, this can lead to Rutgar-4 creating complicated schemes that can baffle less intelligent subordinates. Be it during a fight or life in general, moral compass means little to Rutgar-4. If you don’t want a person harmed, you had better specify. General terms mean nothing to him as Rutgar-4 only deals in specifics. If the rules of a duel say you can’t shoot before the count of three? A grenade over the shoulder is fair game, then. Tell Rutgar-4 to stop someone at all costs, well, you better not be concerned if they’re brought back dead or alive. Rutgar-4 doesn't do anything without first having a plan, and is constantly overheard advising others to always “think through their exits”. Every movement he makes—be it combative, manipulative or otherwise—is premeditated and thought out ahead of time. This foresight often places Rutgar-4 two steps ahead of his peers. However, when plans go awry, Rutgar-4 often has to first backtrack those same two steps to address the present, and that hesitation can often be line between success and failure in the heat of a situation. Rutgar-4 is a lateral thinker, and when he encounters problems or dilemmas, he is very good at improvising and coming up with alternative solutions. This allows Rutgar-4 to find ways out of situations others might give up on. While these solutions are often not so obvious to others, Rutgar-4 can typically explain and lead others through his plan...as long as they are patient and willing enough to trust him outside thinking. Sometimes the only way to prepare for the worst is to always expect it. Rutgar-4 takes this philosophy one step further by never leaving home without accounting for every possible scenario he might expect to encounter. Rutgar-4 tends to always have the right tool or item for a situation and has a habit of quietly and almost smugly presenting solutions before anyone even recognizes there is a problem. This foresight is far from infallible, however, and he often finds himself at a loss in situations that go beyond what he could have imagined. While incredibly practical and often a life-saver in a pinch, his perpetually pessimistic outlook on daily life can be a bit draining on more optimistic-inclined companions. Without the gift of the Force, Rutgar-4 has trained rigorously with a wide range of melee weaponry and technology to better handle opponents that are able to harness the mythical power. Rutgar-4 has been conditioned to fight against foes that are Force-sensitive and are able to compensate against fighting an adversary wielding something as deadly as a lightsaber. While this adaptive combat training makes him lethal in close quarters combat against any kind of threat, they are still at the mercy of a long ranged fighter, assailant or Force user that prefers to attack the mind instead of the body.